I love talking about organization and going after goals and that is exactly what I get to share with you in this episode! In the last couple episodes, you heard from our Your Life Rocks Lifestyle Experts in Health, Finances, and Marriage. 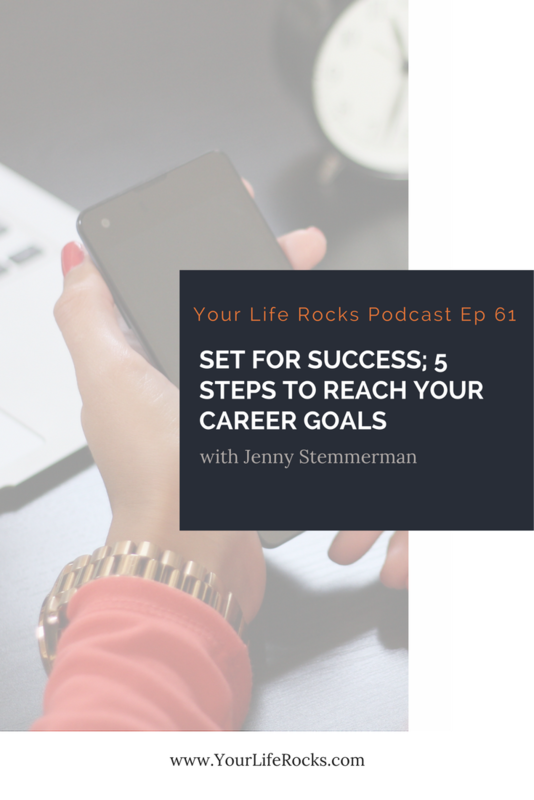 Today is the day we turn toward our career goals with me, your Lifestyle Expert for Career and the creator of Your Life Rocks, Jenny Stemmerman. At the beginning of the year, it is natural to set goals for our careers and businesses. It’s a must for business. Before we get into the details of organizing projects and calendar management, I think it’s important to start with a firm foundation. That’s why the first of these 5 steps is to look at your vision. Let me be really clear, we are talking about the vision for your life-not your career. Creating a vision for just your career is what can really start to create unbalance in our lives. The vision you are creating needs to be for your whole life, all of who you are. Once you have that, then you can craft your career around that life. It’s also important to mention that when we talk about goals and vision, we should be holding onto these things lightly. God might change our heart or our circumstances. Following him and his will for our lives will bring us to where we need to be. Thinking about the vision, how much income will be needed to fulfill that vision? Since your career is probably where you get the bulk of your money, goals in this areas should help you financially create the vision you are working toward. Are your career goals pushing your lifestyle to fit your vision? If your vision is to be home more with your family but you are working toward a promotion that will cause you to travel more….that is out of alignment and you might want to rethink what you are working toward. Do the goals that you are working toward use your talents? God has gifted each of use uniquely. Your gifts might not come into play with your career, but if they don’t be sure that you are finding a way to use them. Wasted talents and gifting is not part of God’s plan. As you list out the projects that need to be done, create a to-do list for each of those projects. You can use whatever system works best for you…I love Trello because it’s easy and I always have it on me. When I learned about the Scrum method of project management….it changed my working life forever! I don’t follow it exactly but have adapted it to work for me. Every two weeks I pick no more than 3 projects….that is it. No more. It creates focused work for me and allows me to make a bigger impact toward my goals. I am always thinking of new ideas and projects and those get added to my Trello board. You might carry some projects beyond the two week period, but every two weeks you get a pivot point. A chance to evaluate and decide if you want to go in a different direction based on the results you are getting or stay the course. 5. Calendar If it doesn’t live on your calendar, it’s not happening. #truth One of the biggest reasons that we don’t get stuff done is because we make a to-do list separate from our calendars. Here is the best way to rectify the situation. First, plug in things that foster the lifestyle you want to create. I’m talking leaving the office on time for family dinner. Working out during your lunch hour, or meeting a friend. Then block off the first 30 minutes of your work day and the last 30 minutes. The first 30 minutes is to plan your day and have communication with people that will be involved with your day. I.E. Delegation. The last 30 minutes of the day is to respond to emails, phone calls, and other things you missed throughout the day. Next, be sure to plug in white space (just 15 minutes) between meetings so you can deal with things that pop up. Then with the time you have left, write in the tasks that need to be completed in order for you to fulfill your projects.